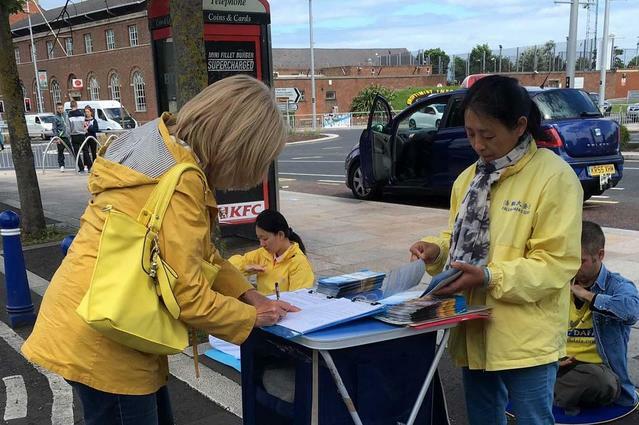 Falun Gong practitioners in Northern Ireland held a signature drive in Bangor, a small town south of Belfast, on June 27 in an effort to stop the state-sanctioned forced organ harvesting from living Falun Gong practitioners in China. J. F. Douglas, a renal transplant expert at Belfast City Hospital, couldn't believe that a foreign state was slaughtering its people on demand to sell their organs to transplant patients. “My work is related to organ transplantation. I can't believe such a large country is doing such inhuman things. This behaviour must be condemned! It is bloody and cruel!” Mr. Douglas remarked. “I want to sign my name to support Falun Gong!” he added. 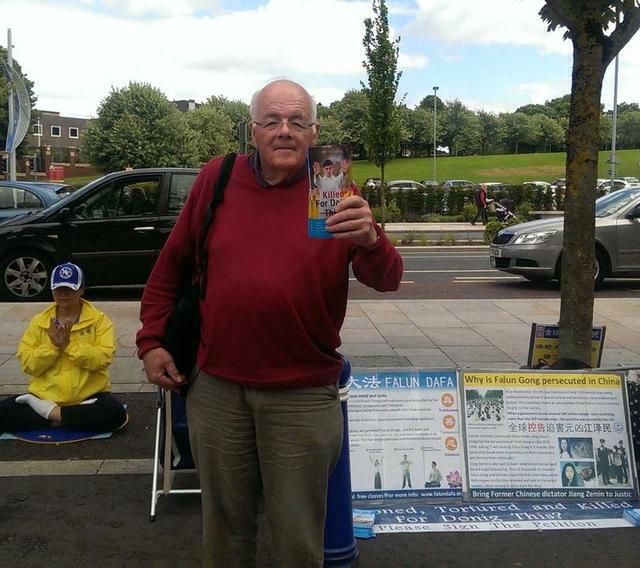 A manager of the Bangor railway station told the practitioners that they could set up banners and tables near the gate to collect signatures after he learned about the organ harvesting crimes in China. “I'd like more people to be aware of the crime happening in China,” he said. “We must stop this atrocity!” said Ms. Wallace after she read the display boards. She had heard of the forced organ harvesting in China while taking a holiday in Las Vegas. Students just getting out of school lined up to sign the petition, as did a number of parents. “You are doing a great thing! Please keep it up. We hope that your activities bring an end to the persecution sooner,” several of the parents commented.